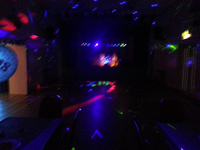 "DJing 25yrs Karaoke 50s To Present Music Try Us Out"
AB Disco and karaoke can cater for most occasions offering a good mix of music, LED and laser lighting, up to 2000W sound system (depending on size of venue) and we welcome requests. We also offer party games for kids parties. Been a dj for over 25 years. Competitively priced - give us a try! Over 25 years' experience. Lots of happy people have booked my disco why don't you give us a try. Required by many venues, AB Disco has a current PLI policy with AMP DJ in the amount of £10 million. Also required by many venues, AB Disco has supplied satisfactory evidence of holding current PAT inspections of their equipment dated within the last 12 months. A Method Statement, outlining AB Disco&apos;s Health & Safety procedure for setting up disco equipment has not been supplied. Why do people choose to book AB Disco? Positive reviews, cheapest quote received. Was impressed by other offers also, but didn’t need anything too technical for this event. "Tony has worked for us in the past, and again he did not disappoint, providing a great sound system and lighting and a professional approach to the event. Reliable and great value for money too." "Thanks for your great feedback hope can be of assistance in the future thanks Tony "
"A very professional, friendly service from the first point of contact. Everyone thoroughly enjoyed the party and the DJ did his upmost to make sure that everyone had a good time, would definitely recommend." "Perfect experience. We held a disco for people with learning difficulties and he was perfectly accommodating. Highly recommend to anyone!" "Thanks for your great feedback glad everything was ok for you hope to see you in the future thanks Tony "
"Hello, I cannot praise AB Disco enough. They were perfect. Excellent choice of music, lightening was brilliant and so was the DJ's interaction. Highly recommended and I will definitely use again should we have another party. Thanks Amanda "
"I can highly recommend this DJ, courteous, prompt, friendly, and excellent value for money. Organising 40th Birthday party was very stressful, but the DJ was in contact prior to the event through email, and was on hand to answer any questions. and it went very smoothly. " "Thanks for your great feedback glad everything was ok for you thanks Tony "
"Amazing! My son and his friends had a great time! Will definitely be using you again!" "Tony was well presented and played a great selection of music even sourcing extra to fit my odd taste. Got my name wrong for most of the night but was funny. Not always easy to understand on the mic either but thats a DJ thing... Just ask Peter Kay!!! Above all, a great evening and would reccomend. " "Outstanding service provided. Lighting lit up the room. Music choices were discussed prior to event. Communication from booking to the event was fantastic, all queries answered efficiently. All requests, even obscure ones from the children fulfilled :) Price was more than acceptable for service given. Will definitely recommend to people for any events forthcoming. Thanks for a cracking night "
"Thanks for your great feedback glad you enjoyed it thanks Tony "
"They were very attentive and really enjoyed our wedding thank you for helping make it a lovely day "
"Our request were slightly different for standard party as our son is special needs and a lot of the guests were also but Ant was great what ever the request he did his upmost to accommodate." "Thanks for your great feedback glad Sean and everybody enjoyed it thanks Tony "
"Really impressed!!! 100% recommend. Played all songs requested and well organised. Amazing price quoted!" "Thanks glad everything was ok for you thanks Tony "
"We had an unusual event but it was no problem to the DJ he did as we required with minimum of fuss"
"Tony was fab! Very professional and the music on the night was great! I would highly recommend him. " "Thanks for great feedback glad everything was ok thanks Tony "
"Antony was a brilliant DJ at my wedding as much as we didn't have many guests so the dance floor wasn't crowded the music and lights were absolutely brilliant and I had a brilliant night. At 1 point I was complaining that he kept putting too much good music on and I needed a drink and to sit down!! Definitely recommend to anyone :) Thankyou for a fantastic night :) "
"Tony was very easy to deal with and friendly, listened to what the children wanted, noted what got them dancing and based the music around this so fun was had by all. Thanks"
"Would recommend again very polite and helpful and a happy person"
"Tony was fantastic, great communication in the run up to the event to ensure I got exactly what I wanted & very reasonably priced. On the day Tony faced some challenges as he was outside & the wind made life very difficult but he had games & prizes for the kids and was a pleasure to have as a big part of the event. Lots of our guests have commented on how good the disco was & I wouldn't hesitate to recommend Tony - he's a great character & a fabulous DJ. Thanks so much for helping to make my 40th birthday party a lovely, memorable event, I'm really glad I booked you!" "Price, communication, effort, friendliness all top notch"
"Fantastic dj well worth the money would definitely book again 👍"
"Tony was challenged with entertaining a range of ages from 7 - 12, he kept the children dancing playing all the current hits. He actively encouraged the children to make requests, with the limited time he managed to fill most requests. We have already made another booking. " "Thanks for your great feedback c u soon thanks Tony "
"Brilliant disco kids had a fantastic time, would definitely recommend." "Tony played a good mix of music for my son's 18th birthday party. He ensured that the songs on our playlist were played and dealt with all requests by our guests. Everyone had a good time and remarked on the sound and lighting. Excellent value for money! " "Thank you for your great feedback glad everything was OK for you hope to see you in the future thanks Tony "
"Communication and the evening it's self was spot on..., totally fuss free and Tony was great at providing all of the music requested (. There were a lot of requests) thank you Tony the night was great! " "He was very helpfully. Give us advice when ask. And everyone had a great night. Would use again with no hesitation. Karen and Dave"
"The dj was fantastic and helped make it a really special day. We had requested a lot of songs and all of them were played and the rest of the music was brilliant. Definitely would recommend him for any event. " "Thank you for your great feedback hope to see you in the future thanks Tony "
"Tony was a really nice man. He played all the music I requested. Everyone at the party said how they enjoyed the night. He was also very competitively priced. Thankyou!" "Tony was fantastic at catering for our party would definately use him again." "This was for my son's 18th and there was a mixed audience of teenagers, parents and older. Tony did a great job, good communication in advance, playlist supplied by my son and followed with judgment by Tony along with response to audience requests on the night also. He also came with his own light system which added to the experience. Overall very pleased with the service and would recommend this independent, experienced DJ"
"I advised the dj before the event this was a very small venue and he didn't need to bring all his equipment, this was ignored. Several times throughout the evening I asked the dj to turn the music down, our guests remained outside and did not come into the venue because they couldn't talk, this was ignored and I was angry with Anthony for not listening to what I wanted, he virtually ruined my wedding reception. There were several occasions throughout the night where the dj played the beginnings of songs and then jumped onto another song and played repeated songs a couple of times in the evening, he his assistant looked at me confused and shrugged his shoulders knowing the dj was messing up. I gave the dj my own playlist and he played songs that were not on my list. When we came to cutting the cake the dj still didn't turn the music down, I was angry about this. At the only point in the evening where anyone got up to dance the dj followed the next song with something that no one could dance to, he did not take any cues from the audience at all throughout the night. Anthony is a typical dj making someone's special day all about himself trying to show off his equipment and skills, I was very disappointed and so were some of my guests, especially my mother who paid for this part of my wedding. In hindsight I would definitely not have chosen this dj for my event." "I did turn the music down and off when you did your speeches. You only told me once about the volume. I played all your request list. I am very disappointed you didn't say anything on the night that you felt I made your evening that bad. I have never in over 25 years of djing had such negative comments "
"We booked Tony for our wedding at short notice. Nothing was too much trouble on the lead up to the day with music choices and arranging set up. Tony arrived in plenty of time and was set up fully with background music for when everyone entered the evening venue room. He turned up well presented and catered to all our music choices, interacted well with everyone and it was a pleasure to have him there. I wouldn't hesitate use Tony again for future events. " "Brilliant Dj done a great job catered for all music would deffo recommend"
"Thanks for the great feedback glad everything was OK for you hope to see you in the future thanks Tony"
"Very professional and friendly guy. Everyone had a great night :)"
"Thanks for your great feedback glad everything was OK for you hope to see you in the future thanks Tony"
"This was one of the cheapest quotes, but it was by no means reflected in the service. Tony was very prompt and professional. His set up was very good, and although there were a few technical glitches with the karaoke this did not spoil the evening in any way. I would definitely recommend him if you have a tight budget and want good value for money." "Thanks for your feedback I did address the problem and hopefully wont happen again but like you said it didnt affect your reception hope to see you in the future thanks Tony"
"Tony was brilliant, friendly, smiley and totally hassle free. He provided the perfect set up and music for my party and his equipment was brilliant. I will definitely use him again in the future! Thanks Tony from Lou"
"Difficult crowd to entertain but a great job. Thank you"
"Thanks for your feedback we managed to get them singing and that got the rest to pick a song glad you enjoyed it hope to see you in the future thanks Tony"
"Tony was fantastic. I am getting married next year and will 100% book him for this. He accomodated entirely our needs and everyone at our party commented on how good he was. Definitely book him. He listens and provides what you want and need and takes on board the event. To my knowledge no-one requested on the night due to the music being spot on and no one felt the need to request as so happy with our Dj. Thank-you Tony X"
"Thank you for your great feedback glad everything was OK for you hope to see you in the future thanks Tony"
"Thanks for your great feedback hope to see you in the future"
"Tony was very helpful and professional throughout. I would definitely booked him again for any event." "My dj did a great job at my event but not all my requests were played"
"Glad everything was OK for your party. Regarding not playing all the request list Im sorry but there was not enough time to play them all even though I did play longer than you put on the initial enquiry thanks Tony"
"Fantastic night made even better by the DJ, was very good value for money and will use again for future family parties, I highly recommend the DJ and he played what we asked for and everyone enjoyed it. Thank you for everything and hope to see you soon at another function." "Fantastic! Everything was perfect from start to finish. Tony and his assistant were very professional and nothing was to much trouble, they did everything they could to make our night brilliant. The equipment, especially the light show was superb! We hold this charity event every year and everyone said it was the best one that they have been to for years. Will definitely be booking him again and would not hesitate to recommend to anyone." "Tony was fantastic, great pre-event communication and great on the night, my mate requested quite a few songs on the night and he had all of them and played all of them!! Throughly recommended and I personally will use again"
"Tony arrived on time, had a great set up and played a great selection of tunes for the youth club's roller disco. He was happy to take requests and we will definitely look forward to booking him again in the near future." "Thanks for the positive feedback glad you enjoyed it hope to see you soon"
"Tony did exactly what we had asked for. He was very friendly and had all the right music for our wedding. I would definitely recommend him or use him again in the future." "Punctual and friendly. Will definitely recommend to friends and use him again for other events. :)"
"Thanks for your feedback glad everything was OK for you c u in the future thanks Tony"
"At believe we made the best choose the DJ was very good. He phoned before the event to find out what songs we want etc and we got exactly what we asked for!! He;s lights were fab and everyone cemented on them. Thank you"
"Thanks to everyone who has given me positive feedback"
Get FREE no-obligation disco quotes from AB Disco and other DJs covering your venue. Take 2 minutes to fill in some basic details and we'll do the rest! If you are contacting AB Disco about an event, it's always a good idea to include the DATE, LOCATION, EVENT TYPE, AGE GROUP and TIMINGS to speed things up!